3 Tpt Sqn ACT Troop members with Association members and Gai Brodtmann MP Shadow Parliamentary Secretary for Defence. The 3rd Transport Squadron (3 Tpt Sqn) is an Army Reserve transport squadron that is the sub-unit of the 5th Combat Service Support Battalion (5 CSSB) that provides second-line transport support to the units of the 5th Brigade. It consists of a Squadron Headquarters (SHQ) and two medium Transport Troops (Tpt Tp), each comprised of three Transport Sections (Tpt Sect). It has an established strength of 76 (5 Officers + 71 Other Ranks) and as of 2014, has an actual manning of 74 (4 Officers + 70 Other Ranks, including 5 ARA soldiers). 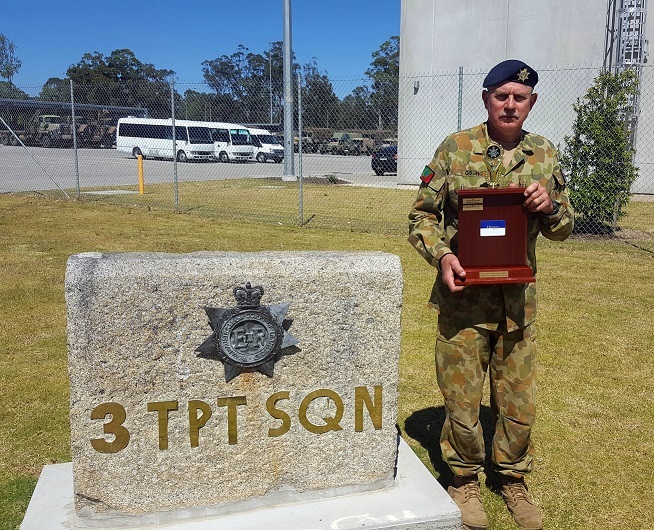 SHQ and one Tpt Tp is located with HQ 5 CSSB at the Banksmeadow Depot in Sydney while the other Tpt Tp is located at HMAS Harman in Canberra. The Sqn operates the Mercedes Benz Unimog medium trucks and is capable of conducting troop and stores lifts. Additionally, it has limited specialist capabilities, including heavy lift, using Mack heavy trucks and 20 tonne plant trailers, operation of Defence ambulances, and the provision and operation of kerbside refuelling points (KRPs). It conducts numerous courses throughout the year to qualify its own soldiers and those of the Bde in the range of GS vehicles operated by the unit and Bde. In 2015, the Banksmeadow based elements of the Sqn will be relocated to new purpose built facilities at Holsworthy as part of the 5 Bde redeployment. In the near future, the Sqn will be transitioning to a new Plan Beersheba structure and establishment with three Transport Troops (one medium, one heavy and one specialised which will include bulk liquids). (This move has been completed). 2014 marks the centenary of the formation of the Sqn’s antecedent unit, 3 Company Australian Army Service Corps (3 Coy AASC) as part of the 1st AIF. This subsequently became 3 Company Royal Australian Army Service Corps (3 Coy RAASC) and 3 Transport Squadron Royal Australian Corps of Transport (3 Tpt Sqn RACT) upon the formation of the Royal Australian Corps of Transport in 1973. The Sqn will be conducting several celebrations in 2014 to commemorate this milestone as one of the oldest RACT sub-units still on the Australian Army ORBAT. I would like to take this opportunity to introduce myself to the Association and provide insight into the Squadron’s activities for 2016. I would also like to thank, Mr Gary Smith for this opportunity to address the Association and to Major Errol Christian for the successful handover of the Squadron. Upon commissioning from the Officer Cadet Training Unit, 1st Training Group in 1992, I was allocated into the Royal Australian Corps of Transport and posted to the 2nd Transport Squadron, then located at Kelvin Grove in Brisbane. As the youngest officer in the Corps for the next 18 months (Commissioned at 19), I served as Troop Commander for Charlie and Bravo Troops (92), Alpha (93) and Headquarter Troops (94-95). I attended Reserve Command and Staff College in 1996 and then held Recruit and Driver Training Instructor positions at the 1st Regional Training Unit, 1st Training Group in 1997-98. I was promoted to Captain in 1999 and posted to the Joint Movement Control Office – Brisbane as Second in Command/Operations Officer. It was during this appointment that I transferred to the Australian Regular Army and fulfilled a number of movement officer and Officer Commanding JMCO(s)/JMCC appointments. I deployed to Timor Leste as a part of MOVCON III and later as Second in Command of the Force Logistic Squadron II for OPERATION TANAGER in 2001. In 2002, I was posted to the 10th Force Support Battalion as Second in Command for the 30th Terminal Squadron, before assuming command of the 42nd Amphibious Troop within the 35th Water Transport Squadron in November of that year. 2004 saw me posted as the Centre of Army Lessons Liaison Officer to the Combat Training Centre before being promoted to Major in 2005 and assuming the appointment of Staff Officer Grade Two Logistics Operations, at the then Land Headquarters Operations Branch. I assumed command of the Ship’s Army Detachment upon HMAS TOBRUK in November 2006 and deployed to the Middle East Area of Operations in support of OPERATION(s) SLIPPER and CATALYST. In late 2007 I deployed again in support of OPERATION RESOLUTE. In 2009 I was posted to the Staff Officer Grade Two at the Commander Amphibious Task Group Headquarters (Fleet HQ) and subsequently attended the Capability and Technology Management Course (CTMC) at the Australian Defence Force Academy in 2011. Upon Completion of CTMC I was posted as the Staff Officer Grade Two-Watercraft at the Joint Amphibious Capability Implementation Team – (AHQ) over the period 2012-13 before electing to transfer back to the Active Army Reserve in 2014. Post transfer I am employed by Calytrix Technologies as a contracted Logistic Planner for Headquarter Joint Operations Command – Directorate of Joint and Combined Exercises. Prior to assuming my appointment as Officer Commanding the 3rd Transport Squadron I served as the Staff Officer Grade Two Post in 2014 and as the Staff Officer Foundation Promotion Advisory Committee/Career Advisor for Active Army Reverse Officers (LT – MAJ) in the Corps of Military Police at the Directorate of Reserve Officer Career Management – Army. At 43 years young I have recently qualified for the second rosette for my Defence long service medal was extremely excited about returning to my roots and assuming command of the 3rd Transport Squadron. I am married to Kelly and have three children; Isabella (12), Alexander (8) and Mikayla (7) and we are just completing our acreage home in Yass and are looking forward to enjoying the rural lifestyle. On behalf of all members we would like to congratulate Errol Christian on his appointment in January 2013 as OC (3 Tpt Sqn) Tpt Coy 5 CSSB. Errol is also a member of the Association and it has been great to see his presence at the ANZAC Day marches. On behalf of all members we wish you the very best in your appointment and look forward in furthering our association with the Unit. the University of New South Wales Regiment. Squadron, 5th Aviation Regiment in Townville. Excellency, the Governor of New South Wales. Banner Party members CPL Wenham, PTE Farley, PTE Peltier and PTE Smith. A custom framed memorabilia of the “Plaque Dedication Ceremony” on the 6th March 2009. The frame containes a photo of the “Plaque”, a copy of Brigadier David Saul’s speech, and four photos portraying the day. The framed memorabilia was donated by this Association and the previous 3 Transport Historical Association. 3 Transport Coy RACT 90th Birthday Party. back some fine memories of the past. the presentation of the “Battle Map “to the Unit by the Historical Society. to have both the Commanding Officer of 5CSSB, LTCOL Linda Reynolds and the O.C. of 3 Transport Coy MAJ. Alison Booth join the association on the night.